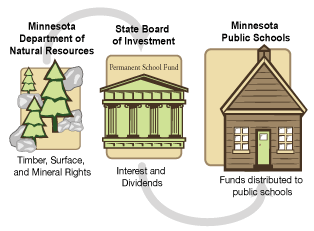 When the State of Minnesota accepted the terms and conditions of the federal land grant in 1858, it accepted the position of Trustee for School Trust Lands and the Permanent School Fund (PSF). The DNR manages School Trust Lands as Trustee, but this relationship also extends to the Minnesota Legislature and other State officials who make decisions affecting the PSF. In 2012, Minnesota Statute, Section 127A.30 established a 12 member group called the Legislative Permanent School Commission (LPSFC). The LPSFC is responsible for reviewing legislation and advising the School Trust Lands Director and DNR on management of School Trust Lands and the Permanent School Fund. The DNR and School Trust Lands Director provide regular reports to the LPSFC who then reports annually to the full legislature. 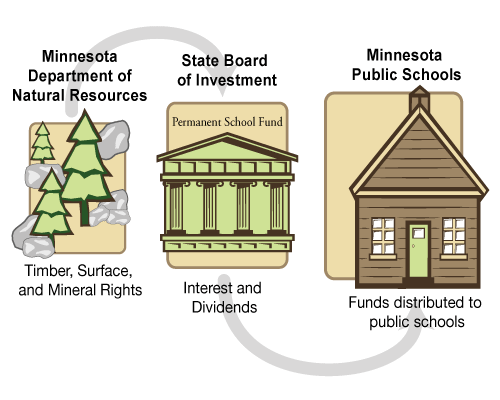 The LPSFC reviews and guides legislation affecting the Permanent School Fund, advises the DNR and School Trust Lands Director’s management, and reports to the full legislature.